Jewelry Design - Wax Carving Classes and Custom Work. 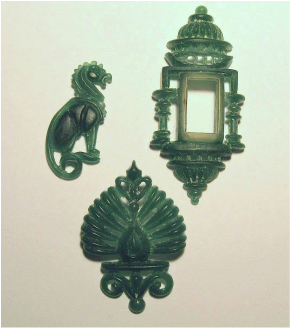 Finestra Designs wax carvings by Jeannette Mullarkey. In addition to making and selling my own jewelry, I also teach jewelry classes with an emphasis on wax carving and construction. I have taught in this medium for over 17 years. I teach classes at the Visual Art Center of New Jersey in Summit NJ and The Banana Factory Art Center in Bethlehem PA.
​My classes are open to all experience levels. I teach personal projects classes which means that everyone in the class works on a project of their choice. I teach my students design concepts as well as the process of wax carving and construction. In addition to wax carving I also cover fabricating in metal, soldering, polishing and stone setting. For more info on classes please contact me here. A basic overview of a special order custom project is shown below. I start with a drawing of my design. In this case, and when I am working on something representational, I also use other reference material. Here I used one of my Orchids as a reference for the form of this flower. Once I am satisfied with the design I start carving the green jewelers wax with files, carving knives and burs. Wax is a wonderful material to use in the creation of fine jewelry. It can be carved and given great detail and dimension. You are making a small scale sculpture when you work with this material! When the carving of the wax model is completed the model is cast in metal. I then polish the casting and set the stone and the project is complete!